ON ONE OF THE WORLD’S FASTEST LINES. The Northern Railway of France claims some of the fastest steam-operated runs in the world. Here is the celebrated “Golden Arrow” express at Calais, beginning its 184-mile journey to Paris, which is covered in 193 minutes. In the reverse direction the time is 187 minutes. The “Nord Express” begins its journey from Paris over Nord metals, and runs non-stop over the 226.7 miles to Liege, in Belgium, in 3 hours 56 minutes. THE Northern Railway of France rightly claims to be one of the most important of the world’s transportation undertakings. Although not the largest of the French railways, this line, in addition to operating a heavy passenger traffic in connexion with Anglo-French movement, handles more than one-fifth of the total goods wagons loaded in all France; and it receives a sixth of the total receipts of the whole French railway system. Its total length is approximately 2,490 miles. Founded in 1845, the Northern Railway of France originally consisted of a main line from Paris to the Belgian frontier, with branches to Calais and Dunkirk. In 1847 amalgamation was effected with the Creil to St. Quentin Railway, and in 1851 with the Amiens to Boulogne Railway. 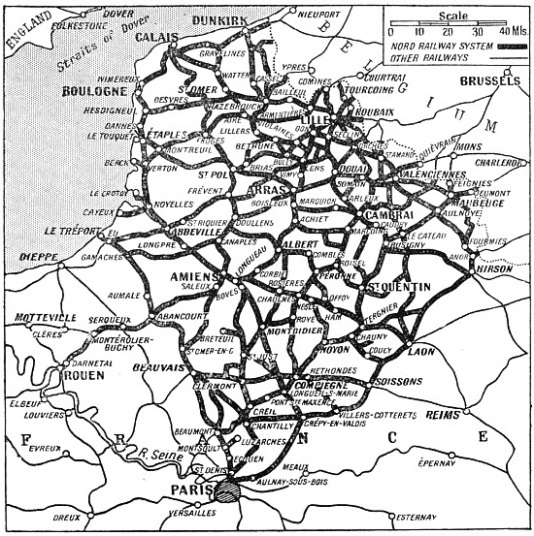 Two years later, the company obtained from the Belgian Government the valuable concession which it still exploits in Belgium, namely the Nord-Belge line. This includes the trunk route from the frontier to Mons and Charleroi, and the line from Givet to Liege, via Namur. From 1875 to 1881 the Nord line undertook the working of a number of less important lines in the districts in which it operated the principal lines of communication, and at the end of the nineteenth century the company was constituted in its present form. As is usual in France, the staff of the Northern line is divided up into three principal services. These are respectively the locomotive and rolling-stock section, the permanent-way and works department, and the traffic department. Each of these departments is classed geographically into divisions, whose duty it is to apply the general directions received from the headquarters in Paris. The locomotive and rolling-stock section controls the construction and maintenance of locomotives and passenger and freight rolling-stock, and the purchase of fuel. The permanent way and works department controls the lay-out, maintenance, and supervision of the permanent-way, architectural construction, buildings of various kinds, and - generally speaking - all civil engineering questions, including the erection of signals. The traffic department supervises the working staff at stations and yards. It has two sub-divisions - the operating and the commercial sections. At the head of the traffic department is placed an official styled the Director of Exploitation, whose responsibility it is to co-ordinate the work of the other two departments according to traffic needs. This co-ordination is effected by contact and frequent conferences between the chiefs of the three departments. From Paris via Amiens to Calais the company operates an important trunk route providing the quickest rail service for Anglo-French traffic. In addition to facilitating international communications, this artery is important as serving all the French tourist resorts on the Channel coast between Le Tréport and the Belgian frontier. The main line to Belgium via St. Quentin diverges from the Calais line at Creil. Near the frontier it divides into two branches: one runs north via Mons, to Brussels, for Antwerp, Rotterdam, and Amsterdam; the other north-east via Charleroi, Namur, and Huy, to Liege. The latter route eventually serves Aix-la-Chapelle, Cologne, the Ruhr, and Berlin, and opens up all central Europe towards Konigsberg, Riga, Reval, and Leningrad on the one hand, and Warsaw, Moscow, and the Orient on the other. A connecting line from Hamm and Hanover leads to Bremen, Hamburg, Copenhagen, Oslo, and Stockholm. These two great international arteries are connected by cross-country lines running from north-west to south-east. Two of these, with Dunkirk and Calais as their north-western termini, ensure rapid connexions between England and the countries of Central, Eastern, and Southern Europe. ABOUT 2,500 MILES OF LINE are operated by the Northern Railway of France. The railway also controls over a hundred miles of line in Belgium. As this map shows, the Nord line serves the wealthy industrial area of north and north-east France. The remaining lines of the Northern Railway owe their importance to the resources of the districts served, and to the heavy traffic in passengers and merchandise carried to and from the mining districts, the large ports, and the areas with abundant agricultural production. One of these lines runs from Paris to Lille, diverging from the Paris-Calais line at Longueau, near Amiens. Through boat-expresses are run from Paris via Lille to Dunkirk, and from Calais and Dunkirk via Lille to Brussels. The Northern Railway has always specialized in high speed for its long-distance expresses. As stated in the chapter “Speed Trains of Europe”, which begins on page 875, the down “Golden Arrow” runs from Paris to Calais, 184.1 miles, in 187 minutes, at a speed of 59 miles an hour. 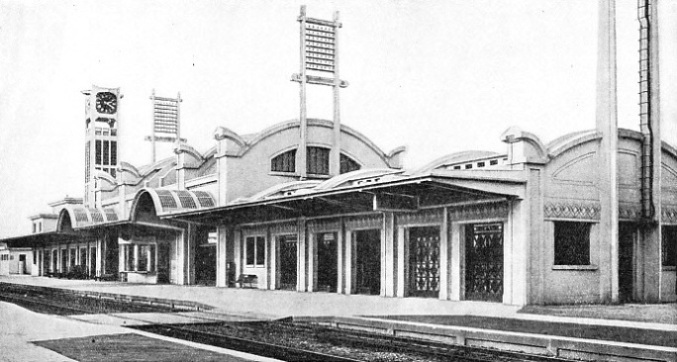 The nonstop Paris-Brussels run of 193.1 miles is effected by the “Blue Bird” Pullman express in three hours at an average speed of 64.3 miles an hour. Between Paris and Etaples, 140.5 miles, an average speed of nearly 64 miles per hour is scheduled for one journey, while between Paris and Arras there is a fine run of 116 minutes for the 119½ miles journey - an average speed of nearly 62 miles an hour. Since equally high speed is not possible on the Belgian connecting lines, the Paris-Liege and Paris-Brussels expresses have very fast start-to-pass bookings on the French side of the Frontier, such as that from Paris to Aulnoye, 133.9 miles in 119 minutes, at 67.5 miles an hour. Trains classified as Rapides and Express serve the principal stations, notably between Paris and Lille, attaining similar high speeds. In addition, local services, offering connexions in heavily populated regions, are operated at speeds over fifty miles an hour where the distance between stations permits. Stopping time at stations has been reduced, and quicker acceleration obtained by special locomotive effort. The average speed of stopping trains has thus been improved from sixteen to twenty-five miles per hour. Eager to improve its short-distance and branch-line services, the company has recently introduced large numbers of rail-cars in place of the conventional heavy steam units. The rail-cars known as “Michelines” have proved very successful. The Northern is, above all, a freight-carrying line. In handling goods traffic particular attention has been paid to speedy transit, and special measures have been taken to meet the demands of each kind of traffic. One important organization is that which caters for the fast movement of fish traffic from the Channel ports. As an example of the expeditious handling of fish traffic, wagons of fish put on rail at Boulogne at 10 am are placed at the consignee’s disposal the next day in Basle at 5.32 am, and in Lyons at 8.15 am. Another arrangement, known as the “merchandise on call” plan, facilitates the rapid transit of the produce of eastern France to the port of Dunkirk. 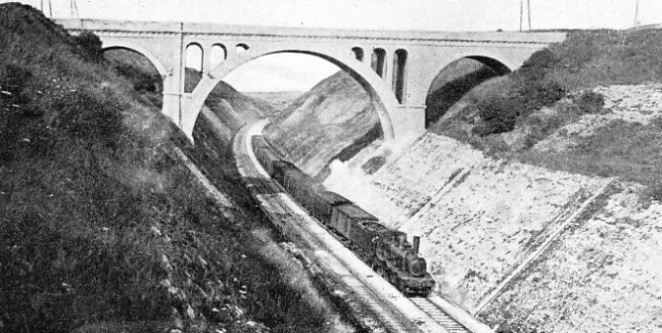 A DEEP CUTTING on the Northern Railway of France near Wimereux, three miles from Boulogne. The railway has sections of its line based on Boulogne, Calais, and Dunkirk, with routes leading towards Centra! and Southern Europe. Recently the general application of continuous brakes to the majority of freight rolling-stock has enabled the acceleration of all goods trains to be accomplished, increasing their maximum speeds from thirty-seven to forty-seven miles an hour, in place of the former maximum of thirty-one miles an hour. In this way it has, for example, been possible to save one hour twenty-five minutes in the movement of coal to Paris from mines in the Nord and Pas-de-Calais Departments. Economies in staff and locomotive running have followed. Through the employment of more powerful engines, also, train loads have been markedly increased, and on some routes loads of 2,165 tons are hauled regularly by one locomotive. A general revision and examination of goods train connexions has secured reductions in the duration of transit, and in certain instances a saving of twenty-four hours. Connexions with other French railways have similarly been improved. Most of the large sorting sidings on the Northern Railway have recently been reconstructed on a new plan, avoiding duplication of shunting movements. The arrival roads are on a gradient, and all of them permit the formation of trains on other roads at lower levels, doing away with the need for engine power for shunting purposes. The formation of outgoing trains is carried out at the other end of the sidings, built with a falling gradient and calling for a minimum of shunting-engine power. This reconstruction work has made the sorting sidings serve as a kind of filter, always in the same direction, whatever may be the origin or destination of the trains handled. To facilitate operations in the sorting sidings, various mechanical methods have been introduced. The Northern Railway of France handles one of the densest traffics in Europe. Paris Nord Station carries at its peak period up to 150 movements per hour, and this on ten roads, which number is limited at present by local conditions. Great advances have been made by the Northern Railway of France in track construction and maintenance, and a journey over its main lines is now fully the equal in smoothness of the best in Great Britain. The rails are 24 metres (78 ft 9-in) long, and weigh a little less than 100 lb per yard. They are of the usual Continental flat-bottomed type, and rest on steel sole-plates; the sleepers are spaced at intervals of 24¾ inches. Curves on the main line are planned on a radius of at least 875 yards, and crossing points are built of one piece of steel to minimize shocks when taken at speed. Block signalling is employed throughout, with repeater signals on the locomotives. A track device automatically engages a special whistle on the locomotive on passing a distant signal at “danger”. On a registering band of the speedometer, fitted to each engine, the speed is recorded, as well as the position of all distant signals passed. This control facilitates inquiry into bad running, and enables disciplinary measures to be taken. for any default. Automatic signalling has been introduced on many sections, but the heavy initial expense of such installations has prevented their general use. LENS STATION, on the Northern system of France, is a striking example of modern French railway architecture. The town, noted for its coal mines, is situated near Arras, and was the scene of heavy fighting during the war of 1914-18. The striking passenger train performances of the Northern Company are rendered possible by the employment of powerful “Super-Pacific” locomotives. These engines are superheated four-cylinder compounds, and are capable of hauling 500-tons trains on the fast Belgian services, and loads of over 600 tons, when required, on those to and from Boulogne and Calais. About nine tons of coal are carried on the tender, and the tank is large enough to permit of non-stop runs of over 200 miles. “Pacific” and “Atlantic” type locomotives are utilized for passenger train haulage on most of the Northern secondary routes. The Paris suburban services, until recently worked by tender engines with six-coupled wheels, are now operated by powerful 4-6-4 and 2-8-2 tanks. These are permanently coupled to their trains, which are worked on the “push-and-pull” principle. The controls of the engine are duplicated in a driving compartment at the rear of the train. A NORD EXPRESS LOCOMOTIVE. This “Super-Pacific” 4-6-2 engine weighs 96 tons without the tender, and is a four-cylinder compound. Engines of this type are used for hauling some of the heaviest expresses on the lines of the Northern Railway of France; trains of over 600 tons are hauled at speeds of well over sixty miles an hour. For its freight services, the Northern Railway principally uses superheated four-cylinder compound locomotives of the “Consolidation” (2-8-0) and 0-10-0 and 2-10-0 types. The “Consolidations” haul coal trains of 1,575 tons on a route with a continuous rise of 1 in 200. In summer these engines also haul certain of the fast trains between Paris and Le Tréport, on which speeds of over sixty miles an hour are required. The 0-10-0 and 2-8-0 locomotives are mainly employed for coal and coke haulage on lines with difficult gradients. Loads up to 1,329 tons are common on an average gradient of 1 in 100. The Northern line operates some of the finest passenger carriage stock in Europe. Recently, particular attention has been devoted to the placing in service of fireproof and collision-proof vehicles of all-steel construction. These carriages are assembled by the self-generating welder, the use of which has become popular in naval construction. The process does away with all rivets, reduces the weight of the vehicle, increases its solidity by causing the body to become virtually one block of steel, and suppresses the noise peculiar to all steel coaches of riveted construction after a period of use. For suburban haulage, the Northern Company utilizes comfortable vehicles, each seating from sixty-four to ninety-eight passengers according to class. The latest examples of these suburban coaches are of all-steel construction. Some of the most up-to-date of French wagons are in service on the Northern system. Special designs of truck have been introduced for particular traffics, and the latest new type to be put into service is a 60-tons tumbrel wagon permitting of entirely automatic unloading. As with railways all over the world, the Northern Railway of France has experienced considerable difficulty in connexion with unregulated road competition. With a view to meeting the situation, the company has set up an independent road-carrying organization, styled the Societe Auxiliare des Transports de la Region du Nord (Auxiliary Transport Company of the Northern Region), to operate complementary services in conjunction with the railway. Non-paying railway passenger services are being replaced by the road services of this auxiliary, and agreements also are being made with outside road-carrying organizations, aiming at increased rail-road co-ordination. The Northern Railway is largely interested in the social questions which arise in every large corporation. It is constantly increasing its activities in ameliorating the living conditions of its numerous staff. It has formed no fewer than thirty-three railway colonies, having a total of 11,000 residences for its employees and their families throughout its system. ON THE SUBURBAN LINES of the Northern Railway of France superheated tank engines are extensively used. The local services of this line have recently been much Improved, and speeds of over fifty miles an hour are common when the distance between stations permits. The photograph shows an all-steel “push-and-pull” suburban train. You can read more on “From Brittany to the Rhine”, “The Rail-Cars of France”, “Speed Trains of Europe” and “Through Southern France” on this website.